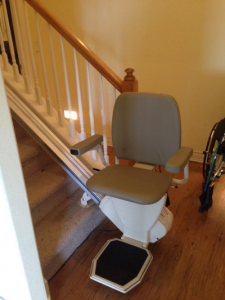 Independently Yours Medical Supplies specializes in stair lift and platform lift installations in Colorado. Our local and family owned and operated business understands the difficulties that come with aging and injuries. One of them being the ability to go up and down the stairs. Whether you need help going up a couple of stairs in your garage with a wheelchair or scooter, or you have two flights of stairs in your home, our lifts from the industry leading manufactures will be able to get you from “A” to “B” safely, quickly and quietly. Our factory certified staff provides a free evaluation and estimate, efficiently and cleanly installs the lifts, and provides a lifetime service on all installed stair lifts and platform lifts. – Stairlifts promote safe and easy travel up and down the stairs. Preventing risk of injury to both the person who needs the lift, and the caregiver. – Easy to use, and promotes user independence. Enables people to use both floors of their house again. – Stairlifts fold up (11″ off the wall) to allow for extra walking space and landings when its not in use. – Includes 2 wireless remotes, so that the stair lift can be operated without the person sitting in the chair. 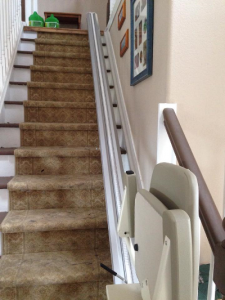 Enables you to bring the stairlift seat from the top or bottom floor to you. Why Choose Independently Yours Medical Supplies for Your Stairlift? – Family Owned and Operated: Independently Yours is local and family owned and operated. Our staff is factory certified and experts regarding the machines and lifts that we install. We are not a large corporation with subbed out laborers and contractors. We treat your home as if it were ours while installing the stair lifts and platform lifts; ensuring there is no damage, installed cleanly, quietly and efficiently. Our customer service is our number one priority. Many times these kind of lifts are needed immediately. Our straight stair lifts (most popular) are stocked and can be installed within that same week. – Free In-Home Consultation: Our expert staff at Independently Yours Medical Supplies provides free in-home consultations and assessments for stair lifts. Deciding what kind of stair lift to get, whether or not it will fit your particular staircase, and how it will operate are all important issues that many potential stairlift customers are faced with. That is why, one of our owners (Bill) who is certified by Harmar, will come to your home to -valuate your staircase, and answer any questions you have regarding the type of stairlift, installation process, operation of the lift, warranty and services and pricing. Call us to schedule your free in home consultation today: 303-840-4444. – Harmar Stair Lifts: We stock and install Harmar Mobility Stair Lifts, a premier leader in the stair lift and platform lift industry. Rather then carrying a variety of brands and styles, making it complicated for you the customer. We carry the best, and specialize in it. We are certified for service and sales. We offer the Harmar Pinnacle SL600 Straight Stair Lift, and the Harmar Helix Curved Stair Lift. The Harmar Stair Lifts mount directly into the steps, preventing any wall damage and making installation quick and easy. The stair lift seat and armrests fold up, includes multiple safety sensons and takes only 11″ of space off the wall allowing ample space to walk up the stairs next to the lift. More importantly, the Harmar Stair Lifts do not require any maintenance on the track, chassis or electronics like many other brands do. – Lifetime Service: Harmar Mobility offers a 3 year warranty on components, 10 year warranty on the gear rack, and a 1 year warranty on the batteries. At Independently Yours, we offer a free lifetime service on all stairlift purchase from us. If there is a repair or service needed on your stair lift, we service it free of charge. The only cost to you, the customer, would be the price of the part needed if it was out of warranty. Many other manufacturers or companies will upsell you on a service contract, or wait for something to need repaired before mentioning their “service fee”. With us, its free. We are family owned and operated. One of our owners is the main stair lift installer, is trained and certified for Harmar Stair Lift installations and repairs. 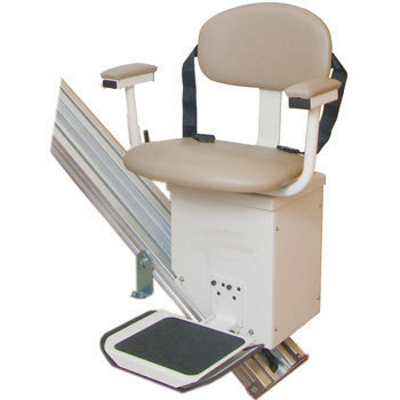 – Narrowest stair lift in the industry – only 10.5” wide when footrest and seat are folded! – Operable in a power outage – up to 60 trips! – True-Curve Rail. Smooth, precise bends and turns. – Easy installation. Simple-connect rails, and lighter chassis. – Full-fold armrests. Simplifies transfer from a wheelchair and reduces stowed width. – No greases or lubricants; easy to vacuum and keep clean. Rack and Pinion Gear Track. The PASSPORT® Vertical Platform Lift takes safe access to the next level, providing a quiet, smooth ride to your next destination. This Vertical Platform Lift is used most commonly for individuals with limited mobility and is the perfect solution for any difficult pathway, porch, or platform. The PASSPORT features durable aluminum construction and is the lightest residential platform lift on the market, weighing an estimated 300 pounds lighter than comparable steel units. – Safety: Undercarriage Platform Safety Pan with obstruction detector takes less than 15 pounds of pressure to stop lift. The lift will still be operational in the upward direction, but the object or obstruction must be cleared to resume downward travel. – Control Box: Multi-positional with keyed operation. Also features continuous, large, low pressure, mushroom head control switches (including emergency stop) that are easy to use, regardless of motor skills. – Diagnostics: High-visibility LED indicator lights on the control box for easy troubleshooting and reduced service calls. – Universal Access: Self-actuating 24-inch entry ramp can be assembled on either end of the platform allowing access to the lift from either side. When the lift rises, the ramp folds upward to provide a safety measure, preventing accidental travel off the platform. – Lightest Platform Lift: The PASSPORT, known on the market as the lightest residential platform lift available, weighs in at less than 400 pounds. – Plug-N-Play Wiring Technology: The platform tower and gate are both prewired with automotive-style connectors that are waterproof and will not corrode. Our Plug-N-Play wiring technology makes the PASSPORT user-friendly, low-maintenance, and the preferred lift of technicians and installers. – DC Powered: The PASSPORT is fully DC powered. On battery power alone, the lift can complete approximately 30 complete cycles, even fully-loaded. – ETL Certified: The PASSPORT has been tested and approved by a national accredited testing laboratory, assuring continued compliance with the applicable regulatory and safety standards throughout North America. The ETL Certification Mark is recognized and accepted proof of third-party inspection, testing, and certification. – Weight Capacity: 750 lbs. – Unit Weight: 376 lbs. – AC Power Cord Length: 12 ft.
– Under Platform Safety: Formed aluminum safety pan with obstruction detector, designed to stop lift upon contact with an obstacle.